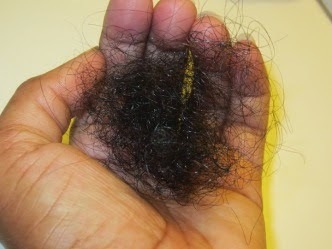 Natural Hair and Shedding- What is Normal? Okay, let me stop being silly. I really do have a point. I know many of us are often concerned about the amount of shed hair that we see, me included! And, we’ve probably all heard that shedding 50-100 hairs a day is normal. 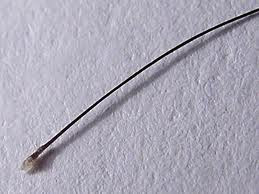 And, we know that most of the hairs we are seeing are shed and not broken, because we see and/or feel the bulb on one end of the strand. But, despite all that, when we see those strands falling free on days that we wear our hair down (HIH is often an accomplice) and see that hair ball getting bigger on wash day as strands litter the bathroom floor, shower walls and drain, it can be unnerving and anxiety-inducing. Well, at least it can be for me! And, when I become concerned about my hair, I put on my research cap and try to understand what is happening. Hopefully, what I’ve learned will be of benefit to others! So, here is a little information about the three phases of the hair life cycle. The resting phase follows the catagen phase and normally lasts about 5-6 weeks. During this time the hair does not grow but stays attached to the follicle while the dermal papilla stays in a resting phase below. Approximately 10-15 percent of all hairs are in this phase at an one time. Now, I’ll issue a couple of disclaimers here. First, all sources don’t agree on the length of time of the Telogen Phase. I’ve found other sites that indicate that it can last as long as 3-4 months. However, the point is that this phase lasts a significant amount of time. In fact, one of my hennaed grey shed hairs is what prompted me to find information on how long the Catagen and Telogen phases last. I had a hair that was red to the tip and I hadn’t hennaed in two months. So, if that hair had been growing, I would have expected to see an inch of grey at the roots. But I didn’t. Now I know why. The second disclaimer is in relation to the Anagen phase. The sources can’t seem to agree on how long this lasts either. Some indicate 2-6 years, whereas others indicate 3-5. However, what is even more interesting to note is that the studies that determined this were extremely limited. [W]hat many people do not know is that the widely quoted scientific figure is in fact based on 2-3 small scale studies which account for as few as 2 individuals. There are in fact no studies which actually track a reasonable group of individuals over a period of years to firmly determine how long the hair growth cycle actually is. Furthermore there is evidence that this 2-6 year widely accepted length could be considerably wrong. One interesting study which measured hair length of visitors to US theme parks and hair lengths recorded online on long hair sites, came to the conclusion that the average normal length of the anagen phase could be as long as 12 to 14 years. Interesting, right?!? Anywho, all this being said, there are a few things to consider when attempting to determine if the amount of hair you are shedding is normal for you. How long is your hair? 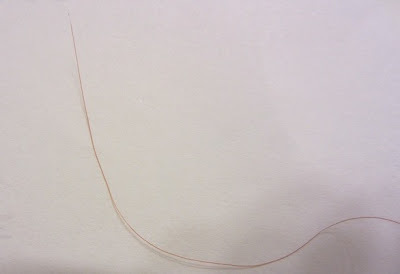 As your hair gets longer, it can create the “optical illusion” that your shedding is increasing. But remember, the same number of hairs that you shed when your hair is shorter will appear like more hair the longer that your hair gets. Ten waist length hairs are going to look like a lot more hair than ten TWA hairs. Is the volume of your shedding consistent? If you’re like me, you never paid too much attention to your shedding until you started a “healthy hair journey.” You have only a vague recollection of how much your hair shed as it didn’t really concern you. Then, you discovered natural hair online. Goodness. LOL!! But, even if you don’t know what your hair shed looked like previously, evaluating it at consistent intervals can allow you to determine whether it’s increasing, decreasing or remaining constant. Some ladies go as far as counting their shed hairs and/or placing them in a baggie to compare from week to week. That would drive me crazy. So, I just look at the size of my hair ball and try to make certain it looks relatively the same from week to week on wash day. Are internal or external factors affecting your shedding rate? As many know, pregnancy hormones can cause the hair to “stick” in the anagen phase, resulting in longer, fuller, thicker hair. A few months after having a baby, all the hair that got “stuck” in the growing phase during pregnancy gets “unstuck” and shedding can decrease dramatically, resulting in bald spots. Hormonal changes due to the aging process can also cause an increase in shedding. Stress can cause excessive shedding as can nutritional deficiencies. Finally, a product that “disagrees” with your scalp and causes irritation can cause shedding above normal rates (e.g. Amla caused me to have a horrible bout of shedding for months). So, all that being said, although I hate seeing that dang ball of hair every wash day, I know that what I’m seeing currently is normal for me. I try not to compare my hair shed to that of others as it would drive me crazy. When I see the amount of shed hair increasing, I try to make the appropriate adjustments. Hence, when my hair was coming out like crazy after using amla for a few months, I stopped using amla. (I also tried black tea rinses, but that didn’t really do much for me.) When my hair was shedding/breaking excessively last fall, I discovered that I was over-conditioned and introduced protein into my regimen and the hair fall decreased dramatically. Now, I definitely don’t have all of the answers. And, if you think that the amount of hair that you are shedding is increasing or abnormal, you should consult with a medical professional. But, I just wanted to share what I have learned in hopes that it will help others understand and analyze their own hair in order to diagnose what is normal and find solutions for what isn’t. Hope that it worked! How do you know if your shedding is normal or abnormal? What techniques and/or products have you found to be effective in controlling excessive shedding? You are so thorough! Thanks for doing all of that research for us! It is so maddening! I don't know if the new growth is from damage, breakage, or a short anagen phase. Is edge hair is considered vellus or terminal hair? I definitely get that same huge hair ball during detangling sessions. I actually remember from wk to wk what size the hair balls are, that way I can determine if I need protein or a protective style for a while. The only time I notice n increase in my shedding is when I'm stressed, but other than that I typically have the same amount of shedding every wk. Great post Shelli. I notice alot of shedding when I take down by braids. My hair sheds quite often! When I first started in my natural hair journey, I was obsessed, so I would collect my shedded hair in a sandwich bag to compare over the months. In doing that, I realized that the amount of hair I shed from week to week was similar and not at all abnormal. Also, I keep track of my hair growth through pictures. I'm able to see my progress and know that my hair is in fact shedding, and not breaking off. (I also pay careful attention at times to whether or not my hair has that white ball at the end). This is a great question! I've noticed a difference in how my "forehead" hair behaves too. I've noticed less shedding (well, it's probably breakage now that I think of it) since switching to a seamless wide toothed comb to detangle instead of a regular shower comb with the lines along the teeth. I also detangle on hair that's loaded with conditioner. I shed like crazy every wash day just about. I freak out everytime thinking I am going bald when I detangle in the shower with conditioner in. I even saw a redish - brownish hair strand through my massive ball of shed hair. I got scared and thought I pulled a strand out and it had blood on it or my hair is changing from black to this because I do not henna at all. Thanks to this article I know why. I will be checking the bulb just as the author of this article will be because collecting hair in a bag ummm...I will pass on that. I don't really worry about shedding. I do take note of breakage though. If full strands are coming out during detangling that's fine, but when I see short broken hairs I know I need to change something up. For my hair, I expect a decent amount of shed hair since I only do a complete wash/deep condition every two weeks (I wear mini twists for 2 weeks at a time) I do get shed hair especially as I style my hair for the day or when I take out the protective style at night. It’s not excessive (like a huge ball, just a few strands), but can be annoying. I want to try black tea rinses and see if that will minimize shedding on wash day. Thank you for this article. Hi Truth! I wrote this response on the post on my site, since you asked there as well. But, figured I'd share it here too for Dawn and others who may be interested in what I learned. Okay, so my delay in responding is because you made me really put on my research cap again!! It was really hard for me to find info on the temple hair. Using "vellus" didn't lead to the information I was seeking. I finally found my best lead when I googled something about hair between forehead and scalp or something like that. The best info I found was on sites related to hair implants! HA!! "Most hairlines are transition zones between the bare forehead and the thick hair of the scalp. Some people have a wider transition zone than others. Some people have solitary hairs in front of the transition zone, while others have a tight frontal hairline. We are all different. When I create a hairline, I always build a wide transition zone between the forehead and the scalp hair behind it so that the point where the hairline starts does not come on strong." If one carefully observes a frontal hairline, one does not see a “line,” but a soft feathery zone produced by a gradation of follicular units of increasing size and density. In women, a 'vellus blush' produced by finer hair, is often noted at the frontal hairline. In men, the aesthetic contribution of these vellus hairs is much less significant, if they are present at all. It has been the practice of some transplant surgeons, using more traditional techniques, to harvest donor hair at the nape of the neck in order to capture some of the fine hair that grows in this area. We advise against this practice because the incidence of unacceptable scarring is quite high in this region and the hair in this location may not be permanent. The use of single hair follicular units can generally produce completely natural results, especially in men, where, in contrast to women, thick terminal hairs are commonly seen along the frontal hairline of the mature individual." Now, the thing is, I don't know how wide this zone of finer/shorter hair is at your temples. But, given that a transition zone can have various widths and is specific to the individual, it may be your natural hairline. If it seems like it's thinning and the hair in parts is the thickness of your other scalp hair, then you make have breakage. But, I suspect it may just be the baby hair in your transition zone. I think that hair is terminal hair as vellus really seems to apply to the peach fuzz hair. I think this hair is terminal hair and not vellus hair. It's fine and has a short growth phase, but it's not as fine or as short as vellus hair and has a very short terminal length in comparison to terminal scalp hair. Hmmm ... when was your last henna or protein treatment Nik? I find they help! I know protein isn't supposed to help with shedding ... but, I always have theories. If hair is over-conditioned, it's softened and I wonder if it softens the roots and makes hair shed more. I'm not scientist ... just a couch biologist;)! LOL!!! Anywho, if it's been a while since your last henna tx, maybe you could do one and see what happens from there? Bernadette, I sense you have a scientific mind;). I'm a right-brain type ... so though I contemplated the baggie thing, knew I didn't have the discipline for it. So, I just eyeball it;). Either way, it's assessing for a short time to find our own "normal"/baseline, so that we can rest easy and also know when something is wrong. LaNeshe ... I probably wouldn't worry as much, except, I'm scared of going bald!! LOL!! See, I'm 40 and I'm thinking age and hormonal changes are impacting my hair as it used to be thicker and curlier, I'm sure. I even did a post on it where I shared pics of my hair when I was in my late 20s and first went natural (a year after my BC). My hair was a LOT curlier and was denser. So, I'm kind of having a mid-life hair crisis as you'll see in this post;). I was being dramatic ... but seriously, my grandmother's hair is super thin!!! So, it's not implausible!! You're very welcome Ms. Alwina;)!! Awww, thanks Aja!! And, you are very welcome:). My hair doesn't shed that much, thankfully. I've been transitioning for 8 months now, and I can tell you I don't look forward to wash day. Every thing I read about research says, says something along the lines of, "is it more than normal"....I can say I didn't pay attention to that stuff, until I started this hair journey, so I don't know my normal. I do notice that I shed more when I wear my hair in braids for braids out, but thats about the only distinction I can make. I hate seeing that hair in the bathroom. I massage a mixture of rosemary+water+vitamin e oil (sometimes jojoba oil or EVOO oil) into my scalp nightly, and I have noticed that my hair sheds less. Great post! I've been increasing my Vitamin D as instructed by my physician. Not enough sunlight in the world for this brown skin. Hi Shelli, love this post! So nice to know someone else goes through the same thing as I do on wash day. Your post led me to your Hairscapades website which I like A LOT! Question: I see that your hair is long and gorgeous .. have you always battled the hair ball on wash day?? Because it doesn't look as though it has effected your growth. I'm only a year into my natural journey, and while my hair has grown a lot since last fall, I'm just worried that the hairballs on wash day will hold me back. Thanks again! Thank you Eniola!! I didn't realize that there were more c omments on this post until today!! So glad that you found it helpful!! Another thing that I forgot to include in this post is seasonal shedding as shedding can increase in the spring and the fall! I was reminded of that about 1-2 weeks ago when my hair started to shed like crazy!! Now, it may have been for other reasons (I skipped a wash and was manipulating my hair a lot), but just wanted to put that out there since fall is rapidly approaching and it is good to be aware that it could happen:). I wish I could say that finger detangling helped my shedding, but it's still the same!! You may have had more breakage mixed with shedding when you were using combs and brushes too. But I love finger detangling too:). Thank you!! Thank you Janay!! And hmmmmmmm ... I have all rosemary, may have to try that!! But, for some reason, I think I remember reading that vitamin E oil may not be good for the scalp? But, hey, I always say, do what works for you too!!! Sorry for the delayed response Yvette!! I'm just seeing it!! Didn't know this post had gotten any more comments until today! As to always having a hair ball ... yes, I have. So, that's why I know that I'm just going to have a lot of shedding, especially on wash day if I've had my hair up all week. But, I've had some bad bouts of shedding that I know I lost far more hair than normal. When that happens, I try to figure out what is going on in order to address it. I had a bad bout from amla added to my henna and it took a while for that to stop, then I had another bad bout when I had stopped using protein entirely and was doing roots only henna treatments, so I started incorporating protein treatments and that helped immediately. And, as I stated above, about a week ago, I was having heavy shedding that I THINK may have been related to us approaching the fall season. But, I'm not sure as it is still a little early for that yet. Also, I think it may have been related to a skipped wash day and over-manipulating my hair. But, all and all, although I generally shed a decent amount of hair, it hasn't impacted my length retention or the health of my hair. I wish it didn't shed so much so that my hair would be denser/thicker though:)!!! LOL!! And thank you so much!! I'm glad you enjoyed my site!! I hope that you have continued to visit:)! !